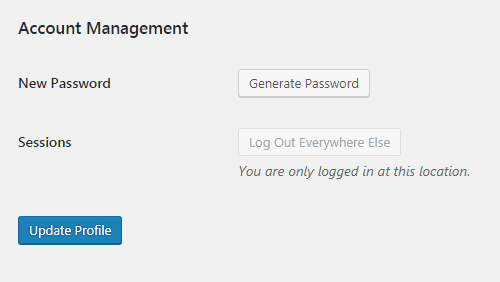 It’s easy to add your event to the database. Here’s how. Log into the Petersfield Community Radio website using your personal login credentials provided by email. 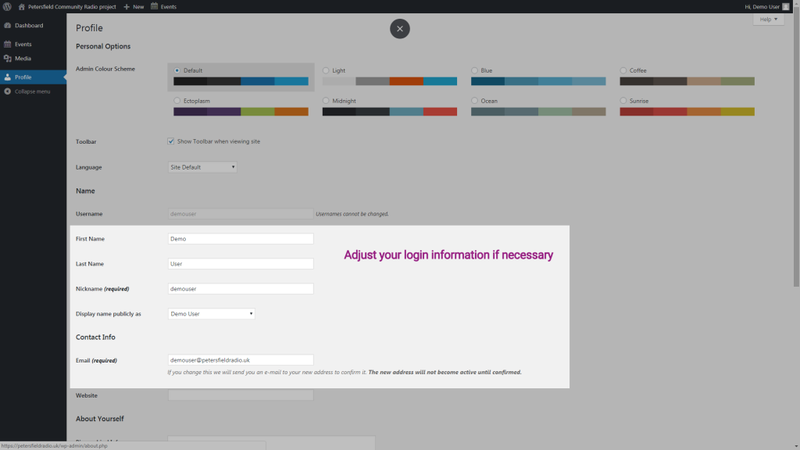 On the Profile screen you can check and adjust your login information including your name and login password. 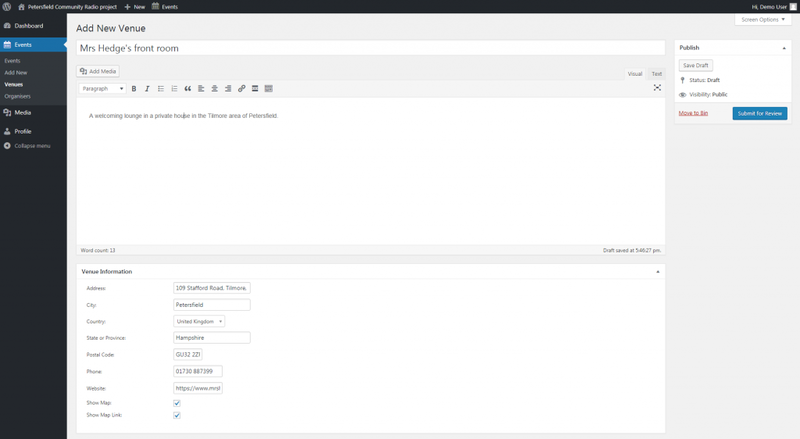 You can also change the colour scheme of the management screen if that’s important to you. This doesn’t change how the website looks to anyone else. If you change anything on the profile screen, scroll down and click the Update Profile button. You’ll only have to do this once. 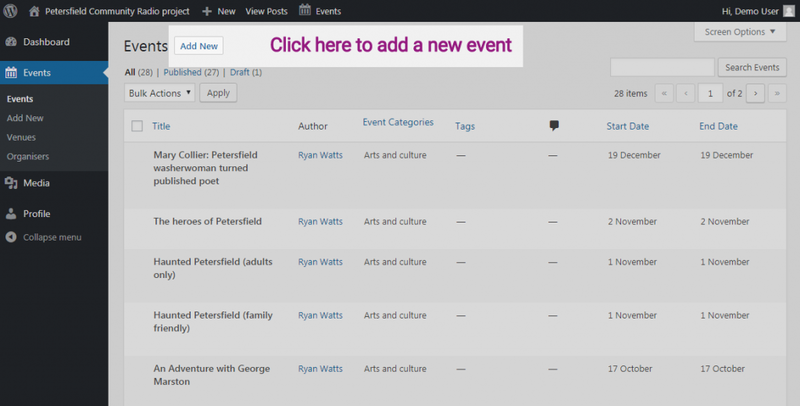 Click Events in the left hand menu and you’ll see all the events currently in the database. If you believe your event may already be in the database you can use the Search box to check. You will now see the Add New Event screen where you can add the main information about your event. Keep your description brief – just enough information to introduce the event and help people decide whether they’d like to go. Once you’ve added Title, Description, Time & Date and chosen an appropriate category you can scroll down and pick the venue for your event. If the venue is not already in the database you can create it here too. Each new venue only has to be added once. Again, there is a list of organisers already in the database. 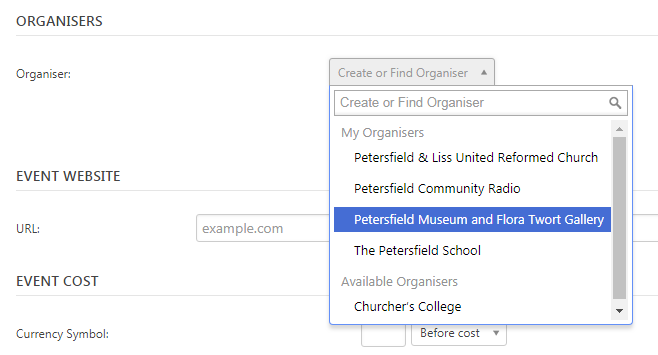 Pick the correct one for your event or add a new organiser if it’s not already in the system. This is optional, but if your event has its own webpage on a different site you can link to it here. This means you can keep your description short and to the point, while still providing further information should anyone need it. If you’re selling tickets, add the price here. If it’s a free event type 0 (zero) into the box. When you’re done, click the Submit for Approval button. One of the Petersfield Community Radio team will check your entry and publish it. 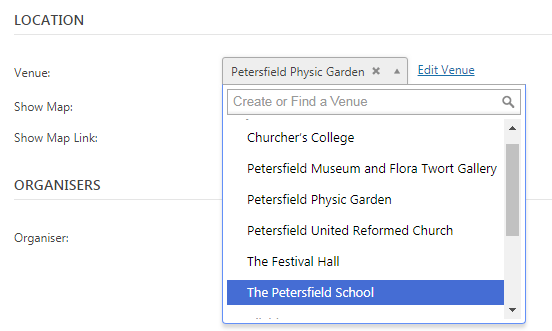 If your venue and/or organiser are not already in the database you can add them. You can either do that within the event itself (as shown above) or you can add venues and organisers separately from the links in the left hand menu. Click Venues in the left hand menu. How to add a Venue. Click for a bigger image. Complete the address fields as fully as you can. The information here drives the map display that will help people find the venue. Leave the two tick-boxes ticked. Click Publish to add the venue to the database. This only has to be done once for each venue in Petersfield. It’s a very similar process if you wish to add a new organiser to the database. Again, this only has to be done once for each organisation.